So I wasn’t put off by the 4 year old’s artwork on the label or the word “organic” and the “suitable for vegetarians” wording… in fact I thought “what a kiddie friendly nicey nicey lager this appears to be” – far removed from the world of wife beater and that disreputable crowd. I even thought I should perhaps drink it with a bendy whirly plastic straw – but saw sense and regained some focus. Into the glass it went – a yellowish and light straw colour with a small and quickly disappearing head. Chalky and floral smells to the nose and a slight hint of dog fart – but that could have been Otto my Schnauzer who was having bunny dreams near by..
And taste – not too bad – strong with good lager malt and yeast – herby and a little malty – with a slight hoppy finish. It also had a nice bite and crispness at the end to make it very refreshing beer. It’s certainly much better than the mass produced stuff and a lot of other lagers I’ve tried – but it really does have that “not bad” label, which also conversely means it’s not amazing either. It’s Mr average or Mr. Nice Guy – quite happy going about it’s lager business – no threat to anyone and always happy to help. And that’s it really – an OK lager – but essentially not great and I would only buy it again if on special offer – a Bru! review rating of 2.75 – but I don’t do decimals – so I’ll be nice too and let it get away with a 3! Oh and by the way – it was the dog not the beer! We have collected and grown old traditional hop varieties and selected the best combination of these for their aroma, and balanced them with additional organically grown hops, in this, our first beer. Although we farm under both biodynamic and organic standards, we go much further in our quest to produce the very best hops and barley. Our micro-biology lab continuously tests the soils, adding compost and compost teas so that the biology in the soil has the right proportions of beneficial bacteria and fungi for the hops and barley to be at their and most flavoursome. This creates the deep flavours of the beer. 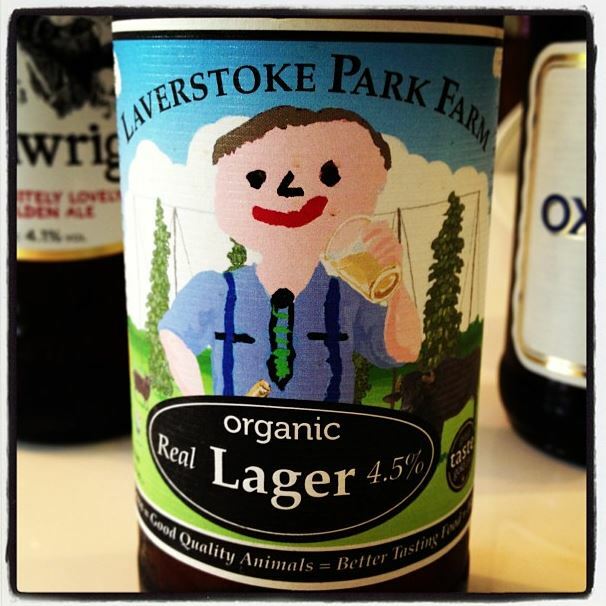 Laverstoke organic larger is suitable for vegetarians.